What happened Sunday morning will haunt Austin resident Marcus Jones the rest of his life. The 23-year-old was walking down Jackson Boulevard with his dog Sunday morning, a path he often takes, when he saw his father’s hat and his uncle’s suit jacket scattered a few feet from the front door of Friendship Baptist Church. “It hurts, it literally hurts,” Jones said Monday night as he sat on the front steps of the church, where his father and uncle were shot to death a day before by two gunmen. He suspects gang members were seeking retaliation against Jones’ dad, Michael Swift, 46, and Jones’ uncle, Emmanuel Fleming, 34. The fatal shootings happened Sunday about 11:15 a.m. as Swift and Fleming – both members of Friendship Baptist Church – were on their way to weekly services with three young children, police said. “The three kids are my nephew and nieces,” Jones said, adding they were able to rush into the church and escape physical harm. But everything has changed for his nephew and nieces. 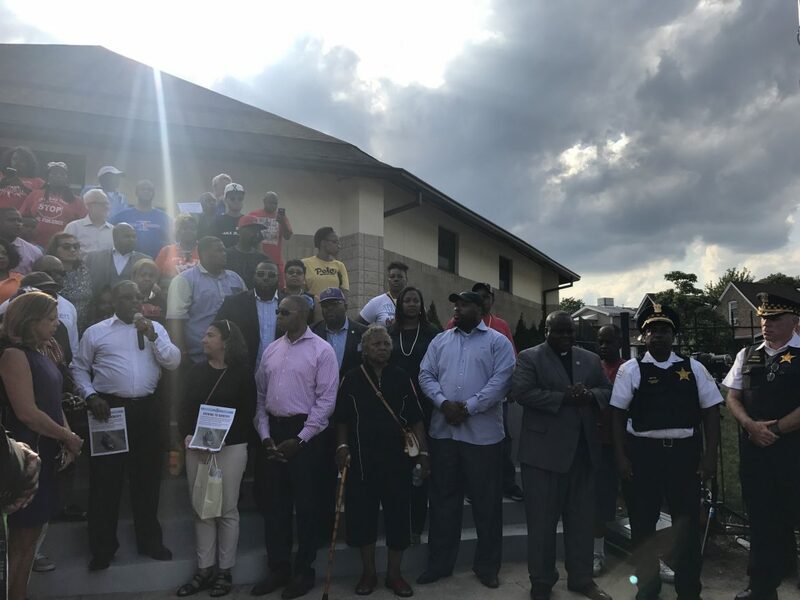 Sunday’s tragedy prompted dozens of local residents, church members, police officers and elected officials to turn out Monday evening for a prayerful rally in front of the church, at 5200 W. Jackson Blvd. “We want the community to know that it’s the time for change in our community,” said Rev. Reginald Bachus, pastor of Friendship Baptist Church. “We can no longer tolerate the senseless violence,” he said as he and other church members passed out flyers of the suspects’ black vehicle police are searching for. Last weekend, nine people were killed and at least 30 others wounded in shootings across Chicago, most of which happened on the city’s South and West sides, according to the CBS Chicago. “Our prayers go out to those who lost their lives but also to those who are continually being terrorized in this community,” Cook County Commissioner Richard Boykin said during the rally. More than 85 percent of the more than 400 people who’ve been killed so far this year are African American – and many have been killed at the hands of their own people, he said. The crime is intolerable, said Ald. Jason Ervin (28th), who called upon residents to stand firm against gun violence. 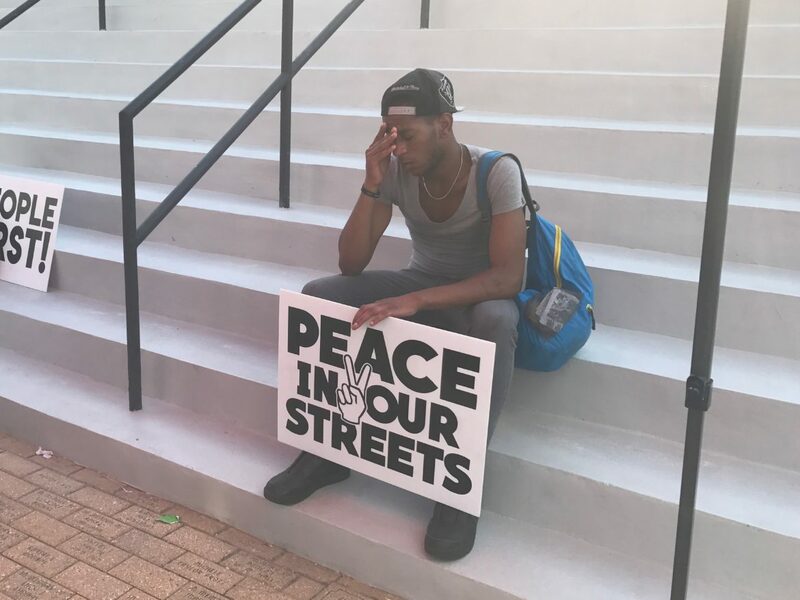 About 50 people later marched down Adams Street in protest of the violence that has shocked the city and sparked outrage among church members and the Austin community. Churches and residents must unite against crime, residents said. “Everybody gets so used to it, and it’s not news anymore,” said Dominic Doherty, 82, a longtime Oak Park resident and member of St. Giles Catholic Church, who showed up Monday night to support the victims’ families. Austin resident Lisa Le’sure was also there Monday night. She wished even more people had turned out Monday night. “We need to have parents and kids to be in the march and protest,” she said, adding schools have failed to provide the needed education to reduce crime and violence in the neighborhood. Monday’s gathering ended with a prayer delivered by Rev. Steve Epting, pastor at Hope Community Church. “We want to pray for this church and those families as they are going to deal with this tragedy in the days to come,” he said, urging people to come out as witnesses and to fight for their community.